Tapas is Spanish for “appetizers”. In Spain, these small bites are made with all sorts of ingredients – eggs, seafood, ham and vegetables. Since tomatoes are abundant right now, serve these Tomato-Ricotta Tapas as a starter to any meal. 1. Using a sharp knife, slice off the tomato tops and discard. 2. With an espresso spoon, gently remove the pulp inside tomatoes; discard. 3. Set tomatoes aside on a serving plate. 4. Meanwhile, transfer the ricotta to a 2-cup bowl. 5. Using a spoon, stir in the thyme and finely chopped oregano leaves, salt and pepper. 6. Stir the ricotta mixture well until all ingredients are blended. 7. Transfer the ricotta mixture to a piping bag fitted with a star tip. 8. Fill each tomato with ricotta mixture. 9. Garnish the filled tomatoes with whole oregano leaves (1 per tomato). 10. Serve immediately or refrigerate, covered, up to one hour. 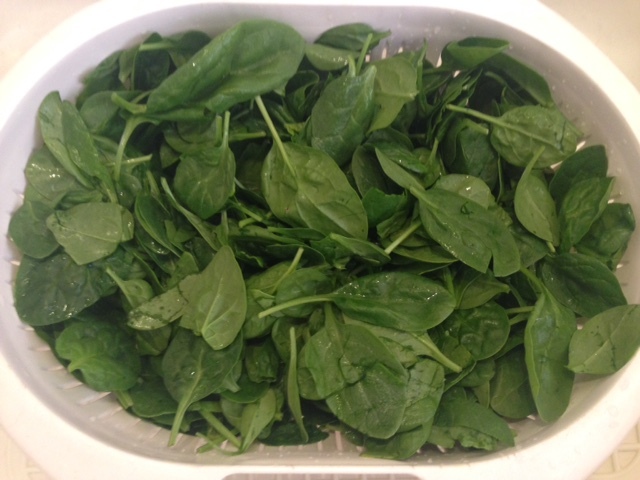 Need to kick up organic spinach so that it tastes awesome? First, add some “heat” to onions by sautéing them with fresh chiles in extra virgin olive oil. Next, toss in the spinach. In minutes, you’ve created a hot and spicy side dish for meat, poultry or fish. Alternatively, enjoy Organic Spinach with Onion Heat atop some toasted Italian bread. 2. When oil is hot, add the onion and chile; stir-fry until onion is translucent and light golden. 3. Toss in the spinach leaves. 4. Using tongs, gently mix to bring the onion slices to the surface of the spinach. 5. Stir-fry, constantly mixing with tongs, on medium-high heat just until the spinach has wilted and barely looks cooked. 6. Add salt, to taste. Serve immediately.